Ideal for the western and english admirer in your life. 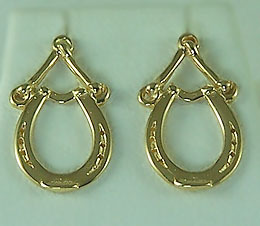 Horseshoe earrings accented with english bits. Here you can have the best of both worlds! Horseshoes and the english bit in one great design. Please her today. Dimensions: 5/8 inches tall x 3/8 inches wide.